The 5 kings retreated to a cave at Makkedah. Joshua ordered stones to be placed in front of the cave to prevent the men from leaving. He also told the Israelites to pursue the armies and destroy them. Joshua had the 5 kings from Jerusalem, Hebron, Jarmuth, Lachish, and Eglon brought before him. He humiliated them by placing feet on top of the kings’ necks. Joshua killed the kings and hung them on trees as signs of what the Lord would do to all the Israelites’ enemies. Later, he threw the kings’ bodies back in the cave. Then Joshua took Makkedah and Libnah and humiliated the king in the same way and left no survivors behind. Joshua conquered Lachish, Gezer, Eglon, Hebron, and Debir, humiliating the kings and completely slaughtering the people. 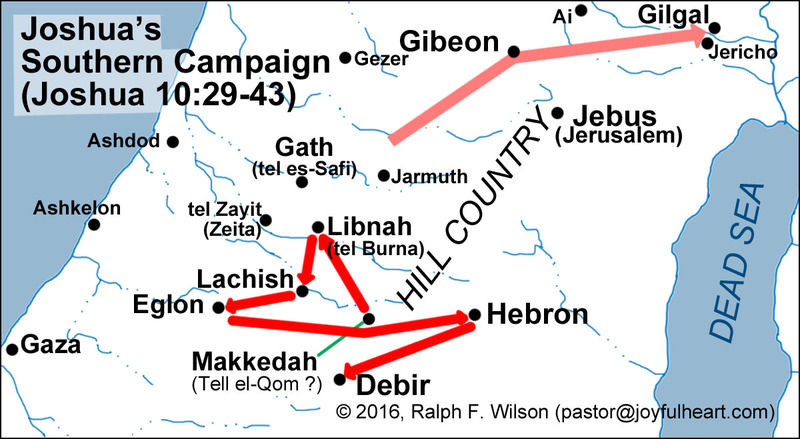 Joshua subdued the whole region from Kadesh Barnea to Gaza and from Goshen to Gibeon–all in one campaign. The Israelites returned to their base at Gilgal when finished. 6) The Canaanites fortified themselves in their cities. The Israelites attacked while all the surrounding Canaanites hid behind walls. The Canaanites knew they would probably lose against Israel’s God. 7) “Come and put your feet on the necks of these kings.” This is an act of humiliation and showed utter submission. This points toward Jesus (most scholars compare Joshua to Jesus) and the Second Coming when all of Jesus’ enemies (Satan) will be put under his feet. 8 ) Personal Question. My answer: So far, we’ve seen what happens when you have faith. You have faith, and God performs miracles for you. I know God is fighting with me and, at times, for me. Nothing is too big to overcome; thus, I should hand all of my battles over to God. The penalty for disobeying God is real. And it’s not pretty. Total annihilation. I wish this would be emphasized more at churches today. Healthy fear of the Lord is a good thing. Too many people sweep Him under the rug. Bad idea. We must remember Joshua is enacting God’s judgment against the nonbelievers by slaughtering them. The Canaanites knew now without a doubt God was with the Israelites–hence the retreat to their fortified cities. Too many people today see the Church occupied by a cozy, warm, forgiving God–which He is. However, church is the place people should know that if you attend, you will be conquered. Surrendering to God is part of the bargain of redemption. Note the repetition of God promising victory over all your enemies. What does the Treatment of the 5 Kings Signify? Joshua performed the executions himself, thereby signifying there is absolutely no place in your life for sin. The men were hung alive–again, a brutal symbol meant to tell the world sin would not be abided. Egyptian and Assyrian sculptures frequently portray the stepping on the neck of a king. This would give the men courage, knowing they could defeat kings with God. The forthcoming battles mentioned could have taken place over months. All were won, but one a time. God told Israel in Exodus 23:30 (and Deuteronomy 7:22) that He would drive out the Canaanites little by little. Israel wasn’t ready to take the land all at once, and God gave it to them in portions they could take as long as they trusted and obeyed Him. God knew which battles to fight and when to fight them. These were not the only Canaanite cities in the region, but they were the military strongholds. God knew what He was doing in selecting which particular battles to fight and when they needed to be fought. Israel’s victories always came from Gilgal. Gilgal was the place where Israel had been conquered by God.